By Terry Miesle - copyright © 2000. The Brakiri are ubiquitous in Babylon 5. They are consummate traders and diplomats, and reserve a prominent place in the League of Non-Aligned Worlds and the later Federation. They are noticable with their bony faces, oily suits and slicked hair. Their technology relies on gravity manipulation, so their ships lack the large reaction engines of most other races. An interesting note for gamers, gravity weapons inflict greater damage on larger targets. This allows Brakiri ships to be used as cruiser-killers at a relatively low fleet cost. The Avioki, the main battlecruiser of the Brakiri fleet, is more powerful in the game system than it seems to be in the show. Its graceful and majestic design has made it a fan favorite despite being blown up nearly every time one is seen. This mini has catapulted to one of the highest-selling units in AoG’s catalog. The mini comes in 4 pieces, a vertical hull (with hollow section), a horizontal hull (which protrudes through the vertical hull), a W-shaped gun and brace section and a U-shaped upper hull support. One disappointing detail is the mis-aligned panel lines on the lower vertical hull. These lines descend toward the front. It’s your choice whether to fill them or live with the casting. After filling a few, I decided to live with the rest. Construction of the Avioki is a little tricky. After cleaning the surfaces and filing any rough spots I attached the U-shaped brace to the horizontal hull with CA glue. I used a small vise to hold the vertical hull and began to check the fit of all the pieces, bending where needed. The gun/brace section needed a bit of bending to fit correctly. Remember, the U-brace should be perpendicular to the forward edge of the vertical hull. I glued U-brace/horizontal hull assembly to the vertical hull while holding the mini at an angle in the vise. When this was half-dry I glued the gun/brace section and made sure all the seams were filled with CA glue. I didn't use accelerator, but let the mini dry overnight. I hoped this would allow the joints full strength and a little flexibility. Even so, the joints are fragile, as filing away the excess glue leaves precious little area for adhering a fairly heavy cantilevered front section. This is a frigate-classed vessel tasked with intercepting fighters. The Avioki in particular is vunerable to fighters, so the Halik is a very important part of the Brakiri fleet. 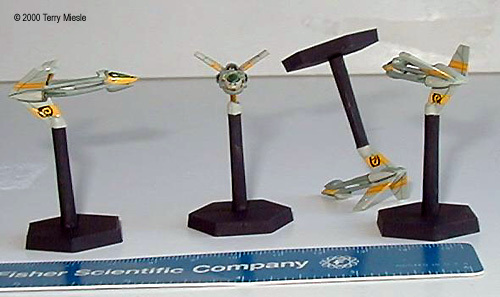 The mini is in 3 pieces, a second pair of struts are cast separately. The mini has firmly engraved panel lines and an aggressive parrot fish shape. Assembly is simple, very slight gaps were filled with CA glue. The newest, biggest, most impressive and most expensive ship in the Brakiri fleet is also by far the most expensive. It partially breaks with traditional Brakiri design and clearly shows some Narn influence while retaining some almost vestigial vertical fins. If you encounter one of these beasts in a mixed Non-Aligned Worlds fleet be very wary. 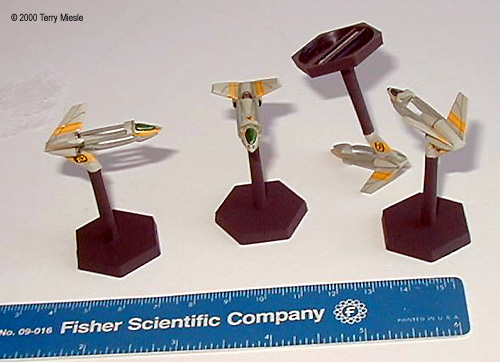 The mini is 3 pieces, a lower wing section and two hull sections, ventral and dorsal. You need to assmemble the hull first. There was a big seam line along the ventral hull, which needed a lot of filing and a bit of filling. The wing fit is difficult, a fair amount of bending is needed to bring the vertical winglets up to meet the wing edges. Filing the gaps there is needed, too. Other than that, the cleanup was straightforward with some substantial mold marks. This is a slick little design, armed with two light graviton beams. This means that it may not do so much damage against smaller combat vessels or fighters, but packs a nice little punch against destroyers and medium cruisers. 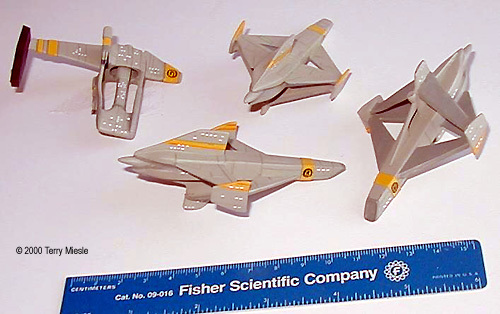 The fighter is two pieces, and assembles readily. 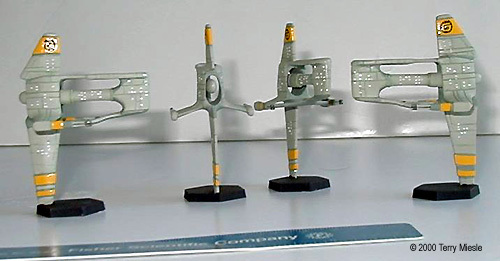 All minis were primed with Gunze-Sangyo (GS) or Tamiya Flat White paints. After this, all were painted with two coats of Tamiya Sky (a light putty green color). With a monochrome, indeed, monocolor subject some forced differentiation can help provide an enhanced sense of size and shape. I did this by hand-painting Testor’s Acryl British Interior Green on the undersides and interior of the ships. This provides a shadow effect to enhance regular lighting. The stripes are GS H-329 Yellow with stripes drawn with a red Micron pen (and a straightedge). I used Tamiya gloss white for the windows. A black micron pen was used for the insignia, which are molded on all the minis except for the fighter and Halik in which case I drew them freehanded. 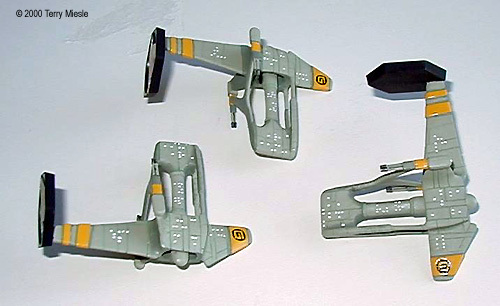 On the Halik and fighter there are metallic green sections. This is achieved with my old trick using Testors Model Master Chrome Silver overcoated with Tamiya Clear Green. I’ve become fond of these Micron pens, can you tell? I used the green pen to highlight panel lines on the ships and the black pen to segregate major areas like the cockpit windows on the fighters. The designs on the Halik are also drawn with red and green and black Micron pens. This was all sealed with a light airbrushed coat of GS Flat Clear. Make sure you don’t disturb any clear paint sections if you want the deep finish to remain undisturbed. Despite tricky construction these are among my favorite minis. 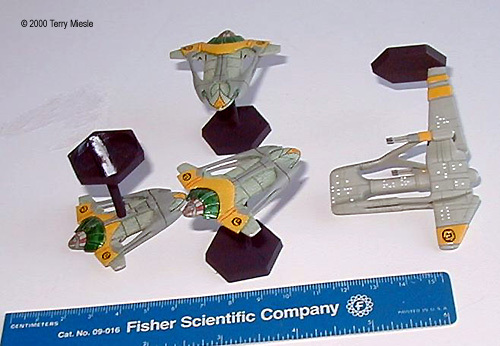 Pale green is an unusual color for spaceships, and it looks very good. These ships are distinctive and immediately hold your attention. 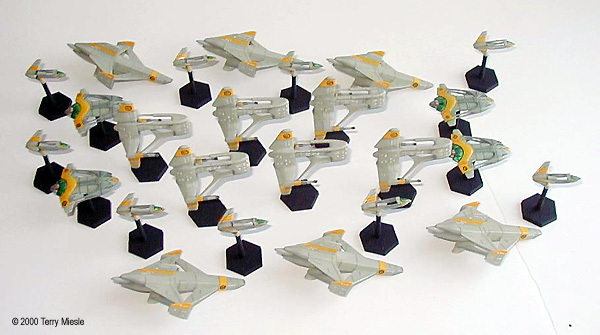 Everyone needs a fleet of Aviokis to play target for Shadows and Centauri, after all. Many thanks to AoG for providing review copies.